This comes on the heels of winning a Gartner Award for being a Cool Vendor in PaaS in July. It is great when the open source software that your brilliant team has been tirelessly working on gets recognized for its quality and its importance. We have created something truly disruptive, and these awards validate our software. As nice as the public recognition may be, we measure success based on the success of our customers. Over the past three months, we have helped scores of customers succeed with AppScale. To refresh, AppScale is an open source implementation of Google’s game-changing platform, App Engine. What that means is that your company can very rapidly develop web and mobile applications using de facto, enterprise-tested and validated API’s, and run those applications on any cloud- public or private. No one else is doing this. With AppScale, you can rapidly prototype and create MVP’s in record time, and have the freedom to run those applications where it makes the most sense for your business. Sometimes that may be Google, and other times it may be AWS, Azure, SoftLayer or one of the thousands of service providers around the globe. We believe that having freedom and control of your application is what allows your company to stay agile, efficient and successful. There is a reason why SnapChat, Khan Academy, BestBuy, Lowes, Briggs & Stratton, Chico’s, Scott’s Miracle-Gro, HomeJoy and millions of other SaaS and enterprise-critical applications run on App Engine. These companies are smart, they understand the importance of time to market, and they’re are not saddled with a LAMP stack mentality. They understand that an MVP that can be quickly tested and iterated upon is invaluable. Execution is critical. Time is money. So, how does AppScale help these smart, forward-thinking companies? The short answer is that we give them simplicity, freedom and control. Many of our customers have built applications in GAE but need to access them in China, where Google is limited. For these customers, we slide their applications off App Engine and onto AppScale and run them in a mainland China datacenter with no modification, no extra work. For some enterprises, their data is simply too valuable to trust in a public cloud, period. They desire to run in an environment where they have complete control. No problem. 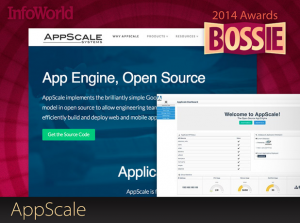 AppScale can run their GAE app wherever they desire and without modification. Some customers have very large monthly bills in App Engine. We relieve that pain by running their GAE SaaS applications on AppScale in a competing public cloud, again, with no modification to their code. If you are running your application on App Engine, AppScale will be an important part of your IT strategy. If not today, soon. Let me know if you would like to talk about the details of our platform or our products. We are always happy to discuss disruptive technologies. I would enjoy the conversation.